North Richmond Hill is the most prosperous part, solidly middle class, with a smattering of beautiful Victorian-style homes. The central area is more densely populated and home to one of the largest Sikh communities outside of India. South Richmond Hill is more working class and dominated by Indo-Guyanese and Trinidadian immigrant community. The northern section of the neighborhood is more well-to-do, higher on the hill bordering Forest Park, and home to a scattering of lovely Victorian homes. As of 2017, the Richmond Hill Historical Society was attempting to have the area designated as an official historic district. The southern slopes of Forest Park form the northern boundary of Richmond Hill. The neighborhood's entrance to the park is dominated by "My Buddy," a bronze statue dedicated in 1926 and sculpted by Joseph Pollia, who later created the General Sheridan monument in Sheridan Square. Its pedestal was designed by William Van Alen, the architect of the Chrysler Building. It is popularly called "The Doughboy," the slang for a World War I Army infantryman, but the official name is "My Buddy" because it depicts a soldier pausing at the grave of a fallen comrade. Showing a soldier bareheaded and at rest rather than in battle was unusual for doughboy statues at the time. The tablet lists the names of the 71 Richmond Hill residents killed in World War I. Since the statue was erected, it has been the site of many of the community's special events and announcements. The "My Buddy" monument is in Forest Park at the intersection of Park Lane South and Myrtle Avenue, Richmond Hill. The former commercial heart of Richmond Hill was the triangle where Jamaica and Myrtle avenues meet. The Triangle Hotel and Triangle Hofbrau were prominent establishments. In Richmond Hill, it's easy to see a real mix of architecture and conditions, especially in the central and southern sections of the neighborhood. 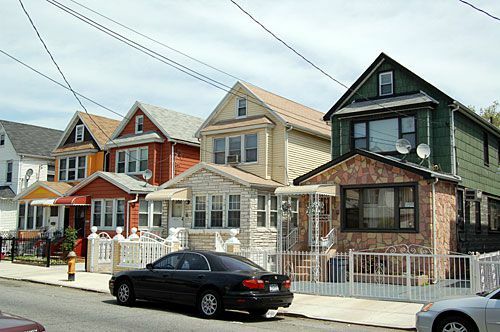 Some blocks and some houses are run down, others are standouts, a few are new multi-families in the "Fedders" style, and still, more are well-maintained, humble abodes. Lt. Frank McConnell Park is a small pocket park, more for sitting in the shade than playing ball. It's named for Lt. Frank McConnell (1896-1918), the first Richmond Hill resident killed in World War I. The park contains the Morris Park World War I Memorial. Sikhs attend several gurdwaras (temples) in central Richmond Hill. The Sikh Cultural Society built this block-sized place of worship next to a temporary gurdwara. The neighborhood along Liberty Avenue in South Richmond Hill is known as Little Guyana for the large Indo-Guyanese immigrant community. Liberty Avenue, particularly extending from the end of the A subway at Lefferts Boulevard toward the Van Wyck, is full of restaurants, shops, and houses of worship with roots in Guyana and Trinidad. It might be easier to find a roti shop than a pizza shop along this stretch. Here the Little Guyana Bake Shop trades on the name -- bakeries in Guyanese culture tend to serve more savory foods rather than sweets. In early spring, the streets of South Richmond Hill are the scene for the Phagwah Parade, the Indo-Caribbean celebration of the Hindu holiday Holi. A mandir is a Hindu temple. A mini-mart is, well, of course, a small grocery store or deli, typical of Queens. This photo of the two side-by-side is typical of Liberty Avenue where the immigrant culture (from the Caribbean shores of South America and its roots in the Indian subcontinent) meets the worlds of New York and America.